Maker Faire 2014: Four Cable Sand Plotter You Can Fold Up and Take With You #BeagleBoneBlack @TXInstruments @BeagleBoardOrg « Adafruit Industries – Makers, hackers, artists, designers and engineers! David Bynoe from Calgary, Alberta shared his portable “Four Cable Sand Plotter” project during prep at Maker Faire Bay Area this year. Matt Richardson interviewed him for MAKE (above). 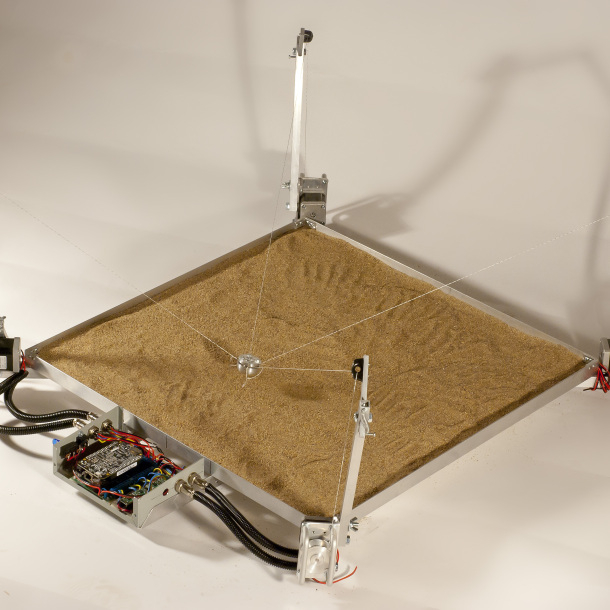 Sure you could use a stick to make drawings in sand, but four high speed stepper motors, high strength string, several pounds of aluminum and some clever CNC software just make it way more awesome.